Irish Patriot Robert Emmet was hanged, drawn and quartered by British rulers back in 1803 -- but not before his speech from the dock in the Dublin courtroom lighted a torch for seekers of freedom everywhere. Across the United States, Irish immigrants named towns Emmetsville (Fl., Tx. ), Emmetsburg (Md., Ia.) and Emmetstown (Oh., Mn. ), to name a few. Statues commemorating his martyrdom abound. But on Embassy Row in Washington, DC, Robert Emmet remains in the dark. 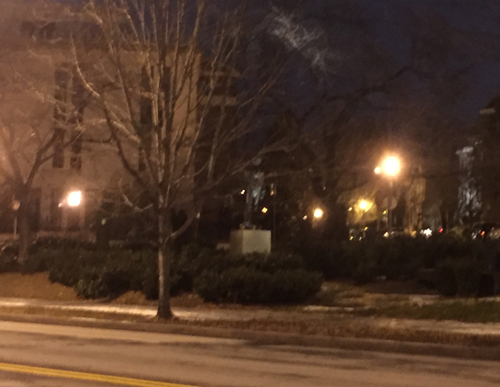 What may be the best statue of Emmet giving his famous speech is barely visible - even after the National Park Service (NPS) turned on the lights in a park that features the statue at Mass Ave, 24th and S Streets NW. Spot the statue? Statue of Robert Emmet seen from Mass Ave at 5:30 pm on December 30. 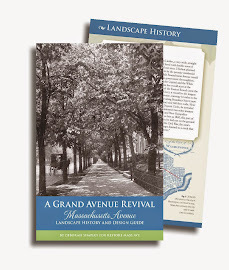 Restore Mass Ave pushed the NPS to illuminate this beautiful bronze figure. We want it to be seen on this busy thoroughfare thronged by cars at night. In 2015, the NPS proposed to refurbish the park improve the statue's visibility, including removing a gigantic cedar tree. We fought removal of the tree while pushing for lights. See Emmet Park: Statue and Cedar can Coexist (November 2015). 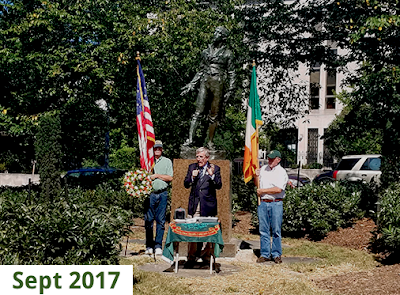 NPS took the tree down in time for a centennial celebration of the 1916 Easter Uprising, held at the park in April 2016. Still - no lights! We reminded the NPS and Smithsonian American Art Museum which owns the statue. Cheerful NPS workers activated the lights in September, in time for another ceremony featuring an address by new Irish Ambassador Daniel Mulhall. Still, per our December 30 photo taken at 5:30 pm, travelers can barely discern the statue - and miss a great moment. The nation's capital needs this inspiring public art to be accessible and admired. Otherwise our Grand Avenue falls short of its purpose as an inspiring civic space.